Welcome all of you to Rideau Hall and to Canada! I’m pleased that we have these gatherings, which not only confirm your presence and role in Canada, but also let me get to know you and your country a little better. 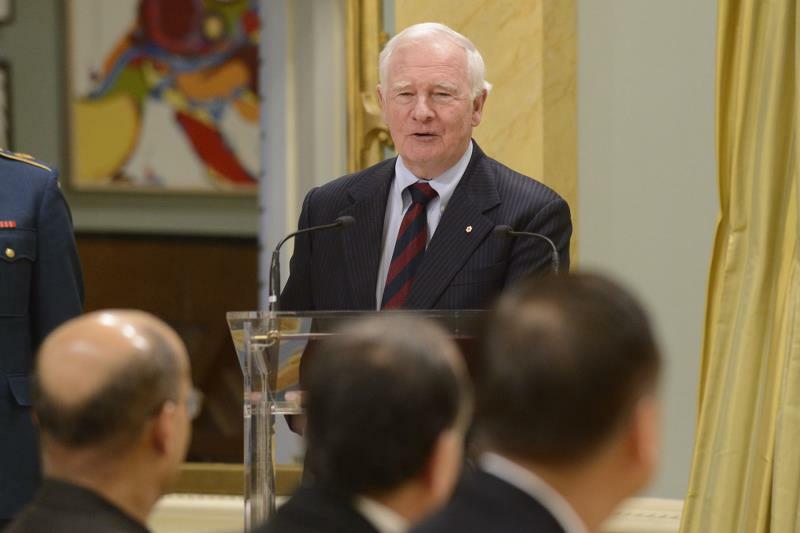 Part of what I do as governor general is speak and engage with the diplomatic corps at a number of events. I see my role as a host, bringing you together and helping you feel at home here. It’s a job I take seriously. It’s so vital to practise diplomacy, to engage in dialogue, to partner in diverse ways. That’s also why I enjoy visiting other countries on behalf of Canada. There’s no substitute, after all, for face-to-face discussion. It’s something Canadian governors general have been doing for many, many years. In fact, past and present governors general have visited each of your nations at one time or another. Today, I’d like to take you back on a “Governor General World Tour,” if you will. Ambassador Vijavat, the relationship between our two countries has been vibrant for more than five decades. Much of the strength lies in our people-to-people ties. My predecessor, the Right Honourable Jeanne Sauvé, visited Thailand in 1987. In fact, she received an honorary doctorate in political science from the University of Chulalongkorn—your alma mater, Ambassador! There, she spoke of our “commonality of purpose and a commitment to internationalism”. That same spirit is still with us today, particularly evidenced through commercial links and our security co-operation, as well as through education. More than 1 300 Thai students studied in Canada in 2012, and we invite even more to learn here. I was pleased to learn that you have visited our country on a number of occasions in the past. There is so much more to discover, and I encourage you to travel and explore widely. Ambassador Meghar, Algeria and Canada have maintained close ties for more than 50 years. You have seen first-hand what our two countries have done together, having spent five years in Ottawa in the 1970s. I think you’ll find a few things have changed since then! But what hasn’t changed is our eagerness to collaborate. That was one of the messages the Right Honourable Michaëlle Jean delivered to Algerians when she visited your country in 2006. She described her trip as “meaningful and emotional,” and said that she was there to share the “friendship of all Canadians.” I welcome you in that same spirit. Today, our two countries continue to find new avenues in which to co-operate. In addition, our education and cultural ties are growing, strengthened by a robust Algerian community in Canada. I hope to learn more about your country during your time here. High Commissioner Lanyasunya, it was former governor general, the Right Honourable Adrienne Clarkson who represented Canada at the Nairobi Summit on a Mine-Free World in 2004. Today, our two countries continue to work together on matters of peacekeeping and security. In fact, Kenya has hosted the International Peace Support Training Centre—where Canadian Armed Forces are deployed—since 1970. It is clear that we share similar goals; for example, achieving regional stability and expanding our economic links. With this in mind, I know there is great potential for increasing our trade and investment. Canadians, you will find, are ideal partners in diverse areas, including resource development. As you are a career diplomat, I know that you will continue to find ways to attract Canadian businesses to invest in Kenya and to find new avenues to share knowledge. High Commissioner Prakash, I have talked about some of my predecessors and their experiences abroad, and have arrived now to my own travels. Last year, I had the good fortune to visit India. I discovered so much about our collaboration in education, research and innovation, culture and so much more. As an aside, I’ll never forget the excitement of being in New Delhi, watching the Canadian men’s hockey team win the gold medal in the Sochi 2014 Winter Olympic Games. It was wonderful to see Canadians and Indians celebrating side by side! The foundation of the relationship between Canada and India is our strong people-to-people ties. With a diaspora of over one million Canadians of Indian descent, there is a powerful link between our nations. I know that we will continue to unlock our potential. Like your peers in this room, you have dedicated your life to diplomacy, which can only benefit the friendship between Canada and India. 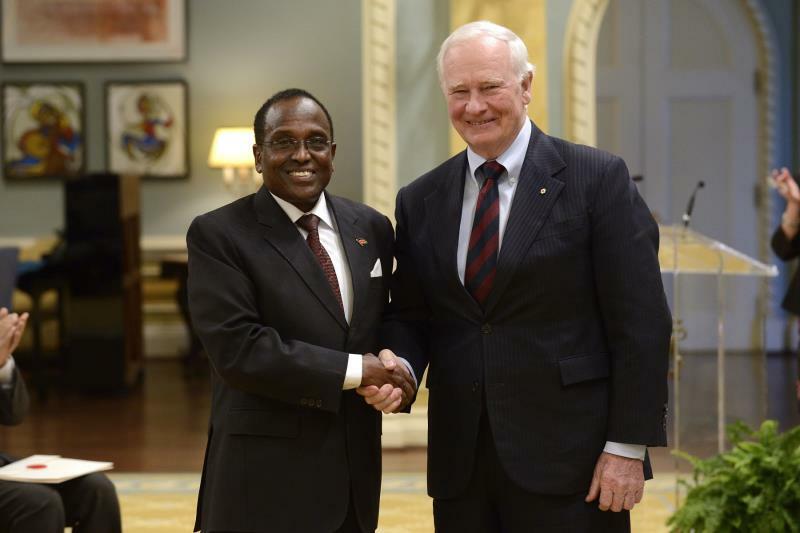 Governors general of Canada have undertaken international visits for years because we know the value of diplomacy. I’m proud to be part of that tradition, and pleased that all of you are here to join in the discussion on behalf of your peoples. To you and your families, I say once again: welcome to Canada. 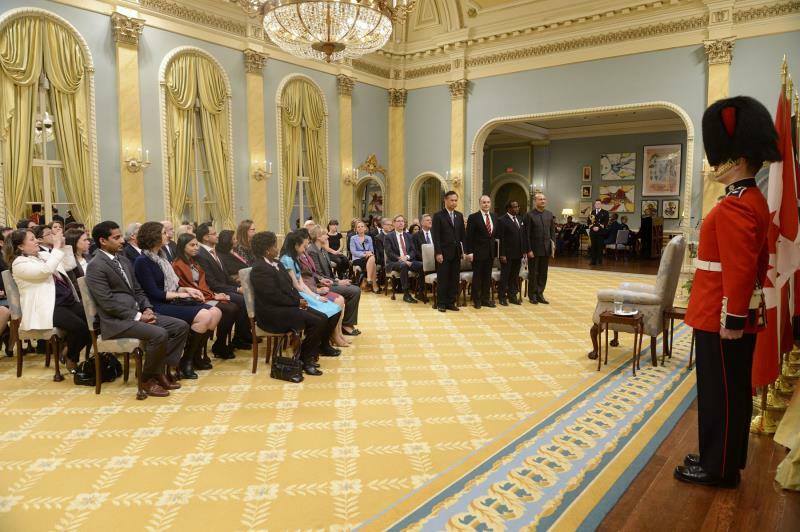 His Excellency the Right Honourable David Johnston, Governor General of Canada, received the letters of credence of four new heads of mission on March 31, 2015, during a ceremony at Rideau Hall. Letters of credence are the official documents by which new heads of diplomatic missions are presented by their head of State as their official representative. 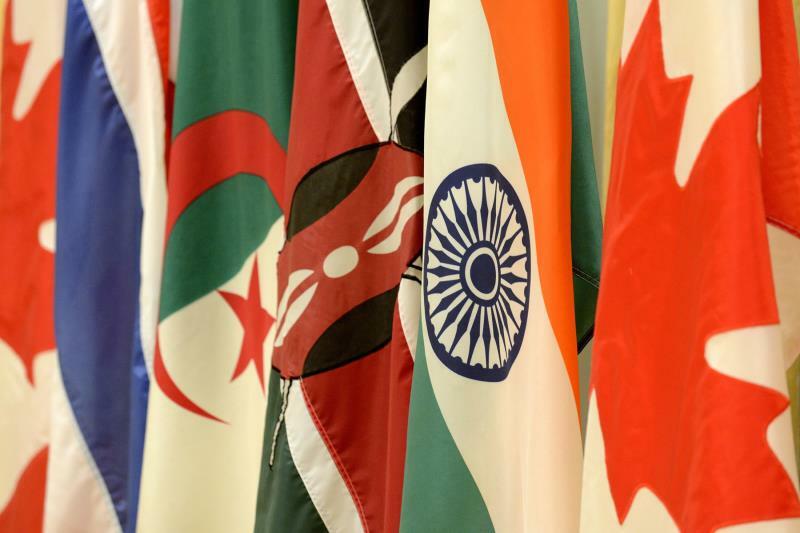 Currently, there are more than 170 heads of diplomatic missions accredited to Canada. “Governors general of Canada have undertaken international visits for years because we know the value of diplomacy. I’m proud to be part of that tradition, and pleased that all of you are here to join in the discussion on behalf of your peoples,” said His Excellency. The Governor General also received the letters of credence of His Excellency John Lepi Lanyasunya, High Commissioner-designate for the Republic of Kenya. 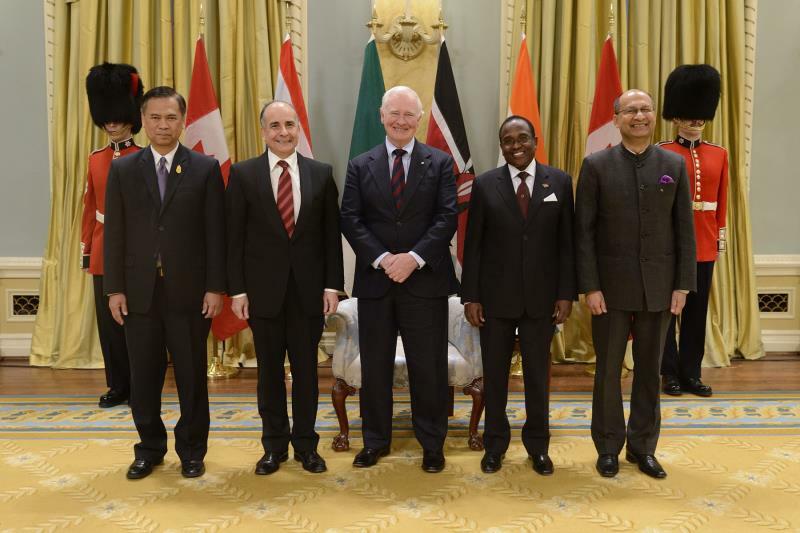 Official photo of the Governor General with the new four heads of mission from Thailand, Algeria, Kenya and India.